SKU: N/A. 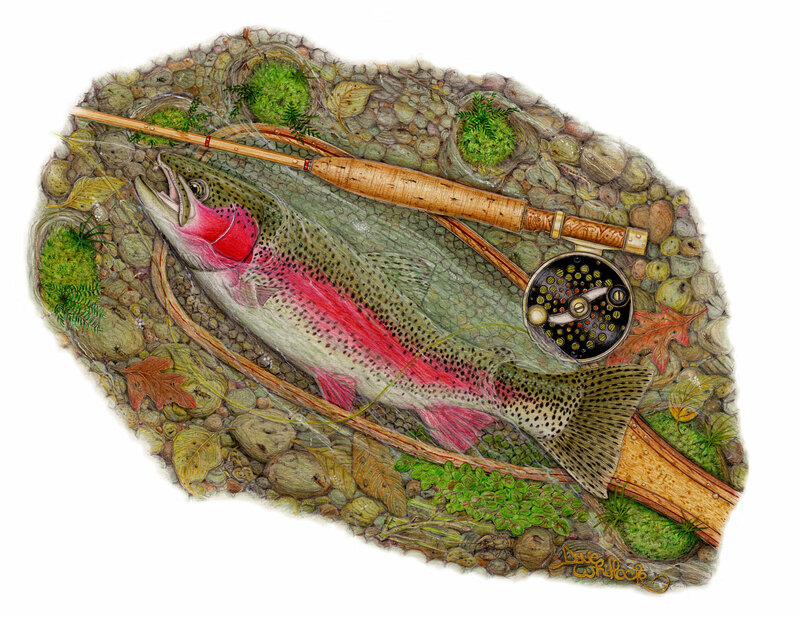 Categories: Art, Limited Editon Prints, Prints, Trout. I wanted to create that perfect memory of magical ingredients: the momentary capture of a beautiful, wild, male, Redband trout that had risen to a size 18, Bluewing Olive Dun – on a 7X tippet and a classic cane rod. If you look closely, I’ve tried to add all the wonderful river bottom structures, water critters and plants that might be found in that colorful situation. NOTE: Dave will sign your art to you personally, if you’d like. To create an very personal print – Dave can sign a name on the bamboo rod and also a significant other’s name on the heart rock in the upper right area. See the insert image. Just let us know in the ‘notes‘ box at check-out. Dave hand-enhances all his limited-edition prints with art pencils, inks and/or paints to enrich the colors and overall effect, adding value and individuality to the each print. A limited-edition is a print that is only available in a limited number. The edition size tells you how many prints are produced and each is hand-signed by the artist and numbered. A number, such as 1/200, means that this is the first print signed and that there are only 200 prints that will ever be created of this work with these particular dimensions.